Shutter to protect fabric during shut down. Efficient uniform self cleaning heaters. Completely prewired three zone automatic control to guarantee uniform heat. Production speed unlimited -- average speed from 25 to 50 YPM. High efficiency -- 90 KW will produce 1000 lbs. double knit polyester. No power requried to operate fans as in hot air systems. Low exhaust temperature reduces pollution and increases efficiency. No down time to clean the self cleaning oven (vs. hot air ovens). Quick installation due to prewired units -- 1/2 day or weekend shut down. Complete material handling to control width and yield in the heatsetting oven. 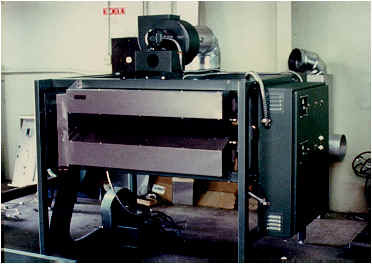 Dual Radiation Oven designed to apply uniform heat to both sides of the fabric. 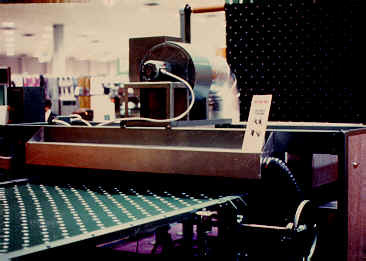 Automatic controlled heat top and bottom. Fabric temperature control to measure fabric temperature. Shutter to cut off heat and protect the fabric when stopped. Complete unwind and wind up provided. Self cleaning oven requires no maintenance. Production speeds unlimited. Typical unit uses 45 KW to produce 15 YPM. Low exhaust temperature reduces pollution. Small size requires less floor space.